I’m not the first to see the strong ties between instructional design and social–ethnographic anthropology. But, a commercial application that evolved out of the marketing and advertising industries of the 1960s (thanks, Don Draper and his one-time love interest, Faye Miller, PhD.) has crept into numerous fields concerned with how people move through their environment and make sense of the information that confronts them. Instructional Design is no exception. However, you won’t be shocked to hear it is an under-applied framework in our field of adult learning. I’ve been part an embarrassingly high number of e-learning projects that did very little examination of when the end-learners would consume the learning. On the job? At home? On the go (mobile)? In a quiet space to allow thoughtful contemplation, or in a chaotic loud environment? Know your learners, and design for where and when they learn as much as how they learn. Priority splits into two parts: Organizational priority (and possible compulsion) and individual priority, the latter being an individual judgment of perceived value and applicability. If it is an organizational priority, be it compliance, orientation/acculturation, or as part of a new systems or process roll out, then the job of motivation is simple. But, the job of meaningful execution to make relevant and applicable is pressure-packed for the instructional design and training team: It better be good, engaging, and fun, or the organization will at you when the learning is not applied on the job. If it is an individual priority, great! Half the battle is won. However, how are folks categorizing, applying, and sharing their self-motivated knowledge? In other words, how does individual learning benefit organizational knowledge and leaning, and vice-versa? This is truly an anthropological question indeed. What kind of community is it? Hyper-competitive? Team-driven all-for-one-and-one-for-all? There are advantages to either, but we had better understand the working culture to roll out effective initiatives and tools to enhance the organizational mission. How will the instruction be delivered? Is it necessary to have folks outside of their normal work day, or can it be integrated into the flow? There is a common idea among software developers that is coined as “being close to the machine.” The way we should approach instruction should be analogous to that: As much as possible align instruction to be a part of the activity into which it will be applied. Integration can be a challenge for us – especially those of us that are used to our “training space.” We may have to shift to more job aides and performance support. Ultimately, we are servants to the end goal of application, not knowledge, and so the delivery platform(s) we choose should be as close to the time of need of application as possible. 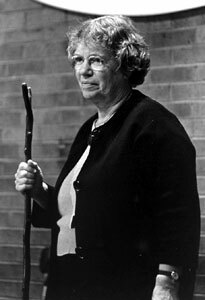 To put a little Margaret Mead into your next learning project, start by putting the design back into instructional design. In short, applying an anthropological lens to our work places the emphasis squarely on design. Design, after all, places human- (and user-) centric experiences at the forefront: Instructional Design (ID) as a distinct practice parallel but apart from Instructional Systems Design (ISD). Instructional design is not all about using PowerPoint, Podcasts, video attached, feedback provision requirements, extensive information and intensive knowledge acquisition. . . . The personal profile of the learner is the pillar of effective instructional design.